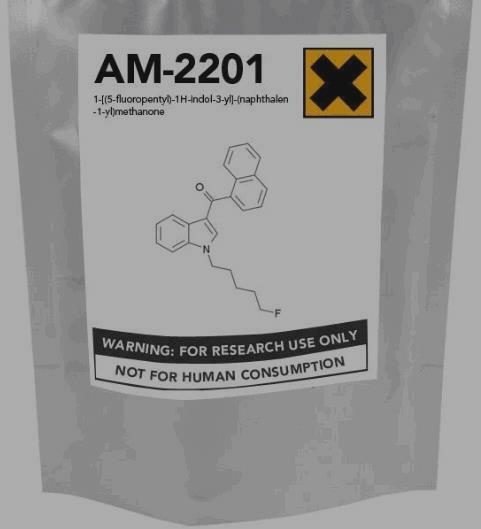 AM-2201 is an aminoalkylindole and an agonist of cannabinoid receptor type 1 (CB 1) and type 2 (CB 2). The data from in vitro studies demonstrate that it is more potent than Δ9‐tetrahydrocannabinol (THC) at CB1 and CB2 receptors. Hence, based on Ki values this chemical is about 40 and 18 times higher affinity than THC for CB1 and CB2 receptors, respectively.Several active metabolites of AM 2201 are identified which are full agonists at cannabinoid receptor. These metabolites are more potent than THC. Similar to natural THC, synthetic cannabinoids bind with cannabinoid receptor 1 (CB1) and cannabinoid receptor 2 (CB2), which are found mostly in the central nervous system but also may be found in peripheral tissues including lungs, liver, and kidneys. However, within the brain, these receptors are mostly located in the cerebral cortex, hippocampus, basal ganglia, and cerebellum. In contrast to THC, which is a partial CB1 receptor agonist, AM2201 is more potent full CB1 agonists. Therefore, in general synthetic cannabinoids have much higher affinity for CB1 receptors than THC. White crystalline solid (in pure form), soluble at ~5mg/ml in ethanol.